Curious to see who your neighbors would have been 100 million years ago? The answer can be found in this interactive map spotted by Popular Mechanics. Compiled using information from the Paleobiology Database, the graphic plots fossils uncovered by paleontologists around the world. The scientists maintaining the database have cataloged a massive amount of fossil discoveries, and they eventually hope to include every fossil ever found. On the website, 350,442 taxa from seven continents spanning more than 500 million years are already represented. "[A] major challenge has been in just gathering all the published data in the first place," Matthew Carrano, a long-time Paleobiology Database contributor and curator of Dinosauria at the Smithsonian Museum of Natural History told mental_floss. "There’s no central place to get it, so I’ve spent a lot of time in the library, looking for papers, reading them, and extracting relevant information and putting it into this online database. We won’t know when we’re done until we stop finding new papers and new reports of dinosaur fossils—and 17 years in, that hasn’t happened yet." Fortunately, the map makes it simple to sift through all that data. Users can search for a fossil by era, the layer of earth or stratum it was found in, or by specific taxonomy. 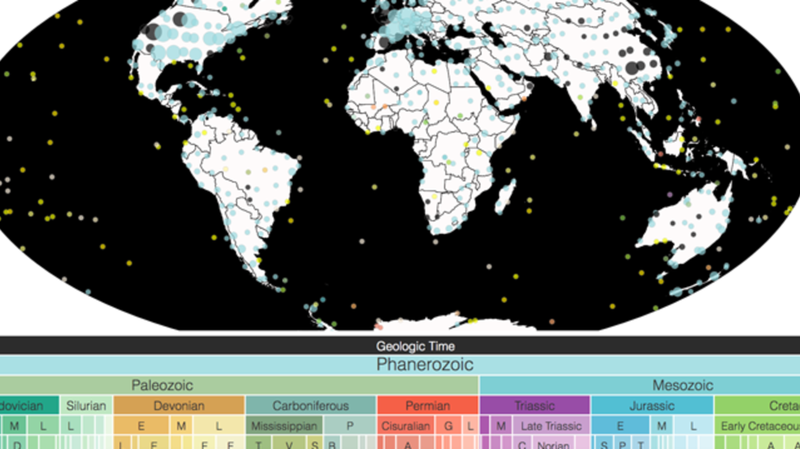 Zooming in on a certain region displays the location of every fossil discovered in that area. Fossils range from mollusks and arthropods to mammals and tyrannosaurs. The tool also gives users the option to switch from a modern view of the world to how it looked at any point in the past half-billion years. "It’s extremely comprehensive, but we’re not quite done yet," Carrano said. "New dinosaurs are being discovered every year, to the tune of a new species every month or two." Whether you want to stick to your backyard or explore fossil discoveries around the globe, you can do it all from the Paleobiology Database's navigator map.